When I look for barbecue, steak or good Filipino food, I usually end up in restaurants with above average prices. Being the matipid me, I thought of doing something different this time around - that is, satisfy my cravings in the food court as a cheaper alternative. 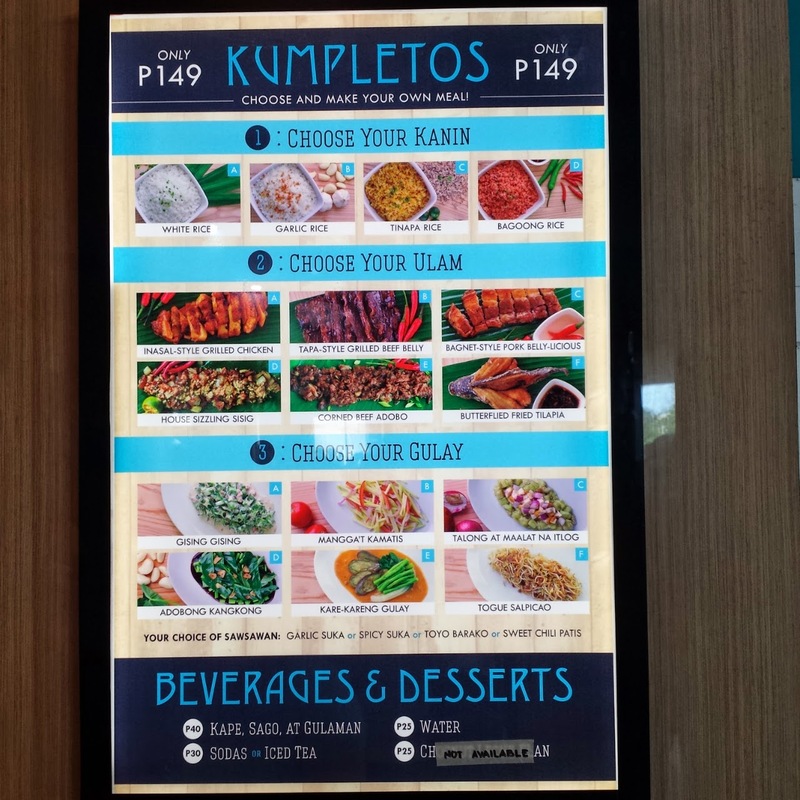 I tagged along my friend MD and went to Glorietta's Food Choices to sample what Manam Express and Q-Daddy have to offer. I found out that these two food on-the-go concepts actually came from the same owners of 'Cue Modern Barbecue, 8Cuts Burger Blends, and more, which aims to also serve the appetites of those on a budget and those looking for quick-to-order food items during short office breaks. 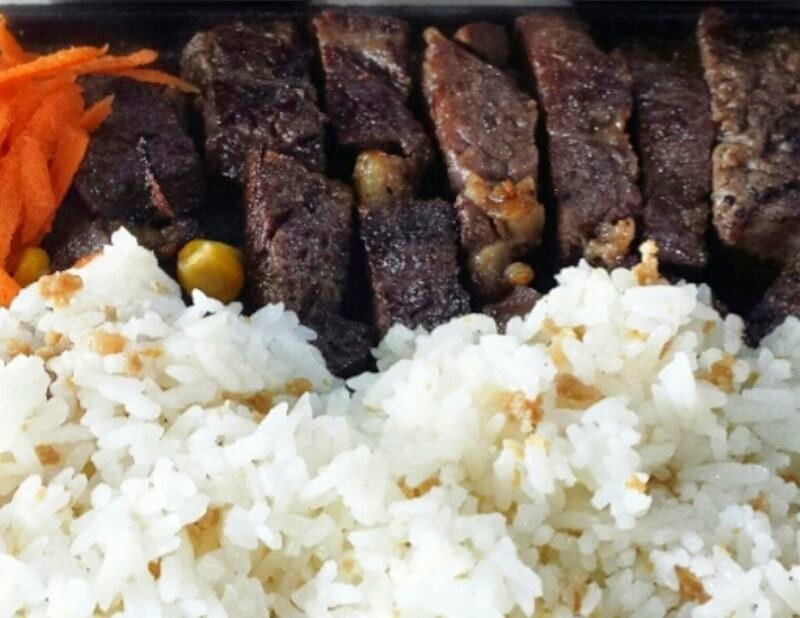 Manam Express offers Filipino comfort food that are truly malinamnam for just Php149/meal. You can mix and match your orders by choosing from four different groups to form one set of your yummy meal. As a first step, you will have to choose what flavor of rice you want. There's white/plain rice, garlic rice, tinapa rice or bagoong rice. Second step is to select your viand from the choices of beef, chicken, pork and fish. Next comes the selection of veggies from six options, then finally choose from four sawsawan of either garlic suka, spicy suka, toyo barako (soy sauce with coffee) or sweet chili patis. 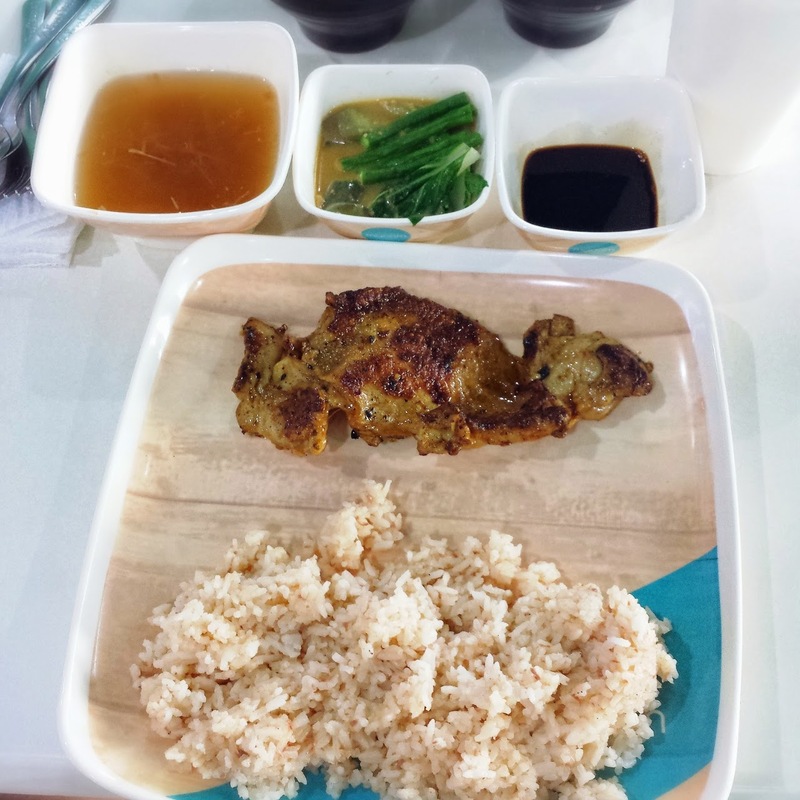 After much deciding, I came up with my own meal of Inasal-style grilled chicken, bagoong rice, kare-kareng gulay, and toyo barako. They also threw in a complementary lemongrass sinigang soup. For its price, I can say that it's a filling meal, not to mention that it tastes great! The chicken was grilled to perfection with the meat tender, juicy, and flavorful. The bagoong rice that came with it had the right mix of bagoong, without being overly salty. Unlike the usual kare-kare that's color orange-ish, this one was brown-ish since they already mixed the bagoong in it. And oh, who would ever think that coffee and soy sauce would actually mix well? It did! 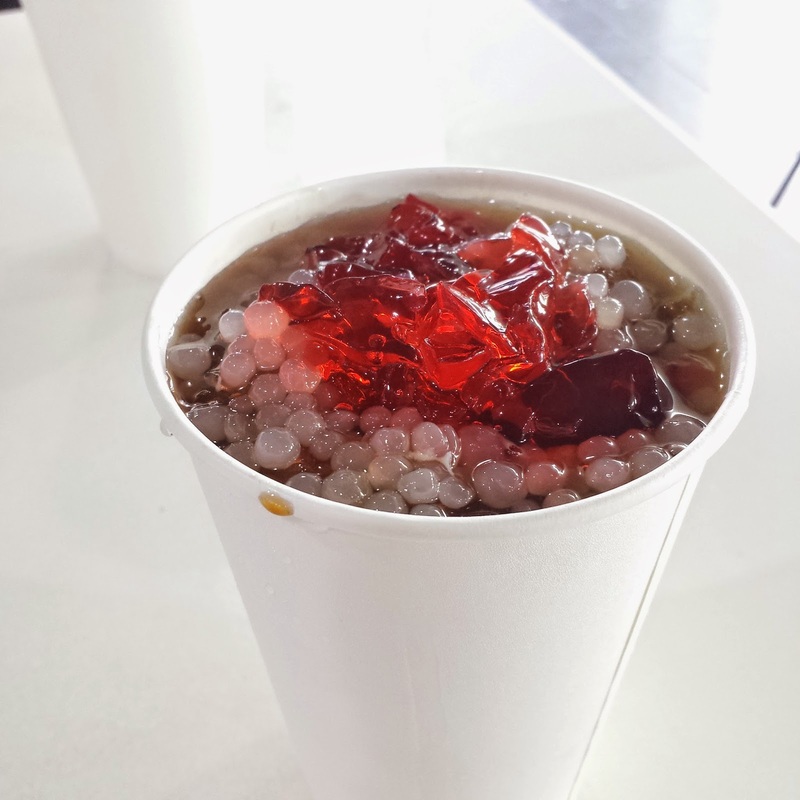 For my dessert and drink, Manam Express' Kape't Sago Gulaman (Php40) has piqued my curiosity. It was surprisingly good, since the coffee actually balanced the taste of the drink and made it not too sweet. Refreshing! 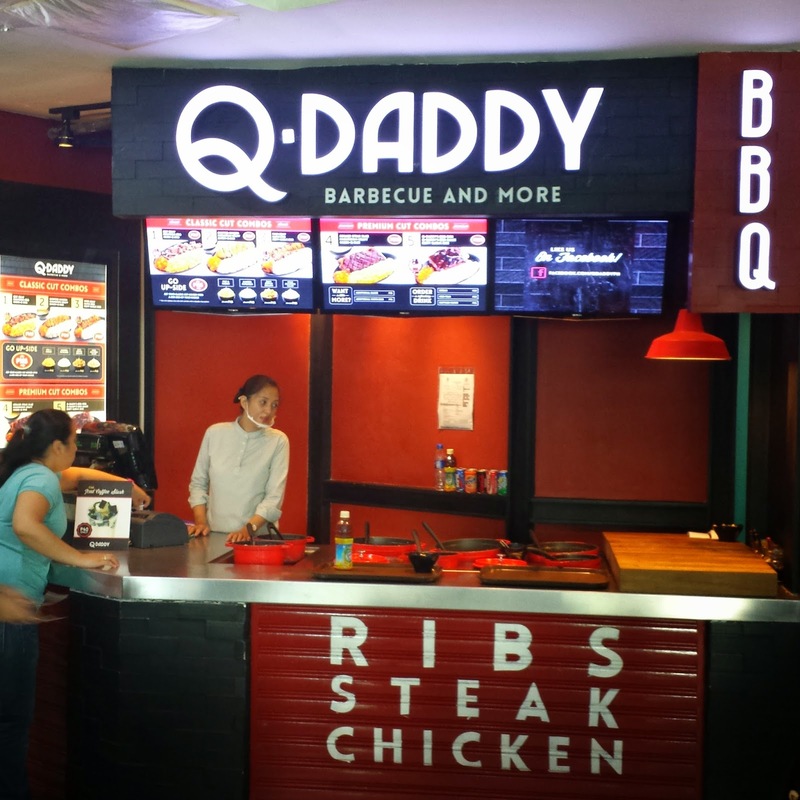 Q-Daddy, on the other hand, offers delicious barbecue plates with choices of pork and beef belly, chopped chicken, steak slab, and ribs. The meat is topped off with one of five signature home-made sauces – maple pepper BBQ, Q-Daddy House BBQ, rootbeer & whiskey BBQ, chili BBQ, and mushroom gravy. To make the meal complete, you can select from choices of special rice, potato or pasta. MD got the Grilled Steak Slab with mushroom gravy (Php245) and corn, carrots on the side. Instead of its default partner, Chori-Q rice, we chose to replace it with the Bacon-Q rice. When I sampled the dish, the steak tasted with full of robust flavor. Its unique spices came alive in my mouth, none overpowering the other, which is good. Coupled with the grilled taste, the steak was fantastic on its own even without the gravy. We were also delighted by the serving size of the meat given its price. As for the Bacon-Q rice that had lots of bacon bits and flavor, I thought it may have been better if I have just stuck with the Chori-Q rice for better combination. 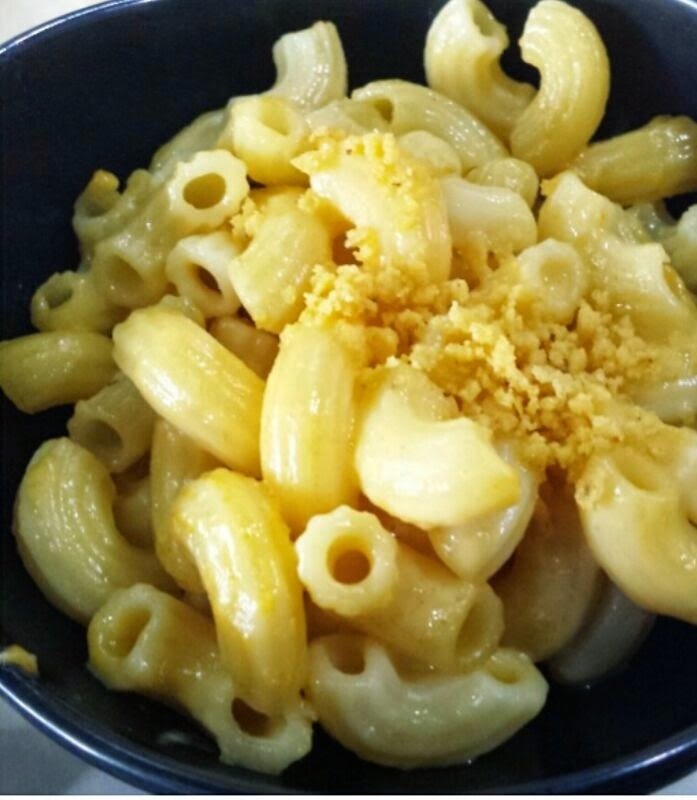 MD also added a side dish of Mac and Cheese (Php45) to complete the meal. Overall it was tasty. It was a bit dry on top, but great underneath since the sauce already fell to the bottom of the bowl. I could taste the cheese flavor, unlike other macaroni and cheeses where there's a lot of sauce but no taste. 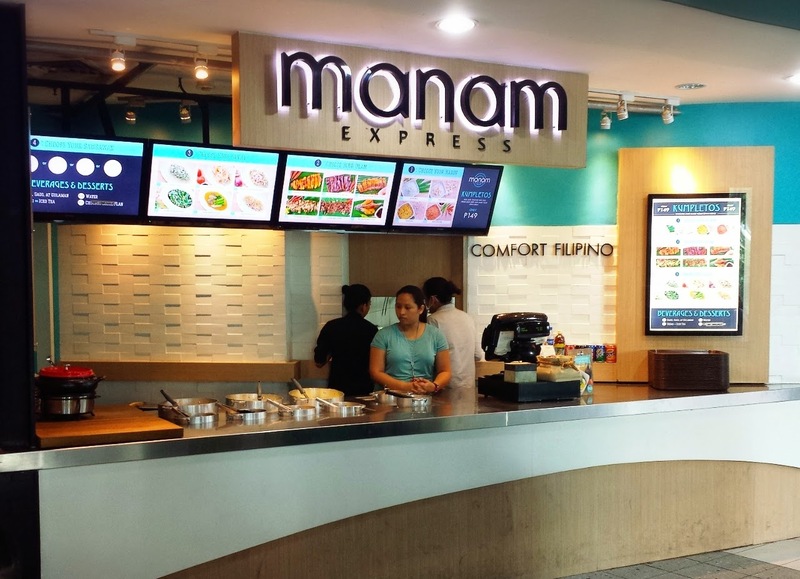 Having tasted Manam Express and Q-Daddy, my praises for the owners went over and beyond expectations once again. The two food brands are true testaments that taste and quality of food need not suffer even at a budget price. Manam Express and Q-Daddy have been standing strong since November 2013. Apart from Glorietta's Food Choices, the two budget-friendly brands can also be found in the TriNoma Food Court.